Merry Christmas! I thought that in honor of the Christmas spirit, I would share this article from the Louisville, Kentucky, Courier Journal. Laura Unger interviewed Rachel Maeser, a 12-year-old girl "who faces a lifetime of pain from a potentially debilitating bone disease called melorheostosis that strikes one in a million people." 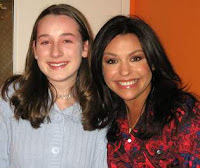 Due to a charitable effort by Texas Roadhouse, Rachel went on a trip to New York city, attended a taping of Rachael Ray's talk show and got to meet Rachael. She also got a tour of the studio and the prep kitchen. Meser says: "It's something I'll remember for the rest of my life." "The director said, 'Come see Rachael,' " Rachel Maeser said. "I started crying." Then she gave Ray a Christmas present. "She made me wonderful dog blankets for my dog, and I love them!" Ray said through a spokeswoman. "Rachel was utterly charming, and she's welcome to visit the show anytime." Rachel and Rachael ended up talking for about 10 or 15 minutes. She says: "She's so sweet." Rachel uses cooking as a form of therapy to lessen the pain she endures from her disease and told Unger that she's a fan of Rachael because: "She's so cheerful and peppy." Rachel found that Rachael Ray's recipes "seemed quick and easy enough for her to try, and Rachel soon started whipping up soups and honey nut chicken, a dish that has become her father's favorite." Rachel's mom summed up the whole experience: "No matter what happens with this disease, throughout her life she'll have this memory of something very special."